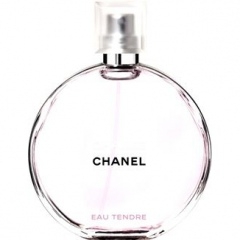 Chance Eau Tendre (Eau de Toilette) is a popular perfume by Chanel for women and was released in 2010. The scent is floral-fresh. It is still in production. Just like a no-brainer, Eau Tendre is for me. When I don't know which scent it should be, my hands always glide over to him. Even though he is often called "nothing spectacular" here, for me he is somehow already. For a long time it was the fragrance of my aunt and I always found it beautiful. Unfortunately, my money has never been enough to afford this sweetheart. Furthermore, I was still of the opinion at that time that this was YOUR fragrance and that I could not buy it because of that. However, my attitude towards belonging to fragrance and wearer has changed and I think everyone can smell as they like. (Imitation is the most beautiful compliment!) One can still make the smell of desire one's own if one wants to, e.g. link it with one's own memories. Or it remains with the association to the original carrier. As you like. Anyway, I've been able to make Eau Tendre my own thing. It is my favorite working fragrance. He is a fresh floral evergreen who is nevertheless extraordinary and stands out from other floral-fresh scents. He kind of has that certain something. The durability is mediocre, 5-6 hours I smell him at me. After that I can only sniff him at my clothes. For me the only Chanel fragrance that suits me. ...that was the base where Chance Eau Tendre came to me. After a long period of abstinence from fragrances, I finally wanted a perfume that would make me feel good all around. Not too sweet, not too heavy, not too girlish, but fresh, flowery, but nevertheless not confusing. Sometimes I can get a bit single-tracked when I put something in my head, and so I literally tried dozens of fragrances in the coming weeks (!). On the strip, on the skin, sometimes both, sometimes three on one arm... So exactly the way you shouldn't do it. But you know, when despair seizes you, you can get a little neurotic - at least me. At some point I literally had had enough and I decided to simply buy a fragrance to put an end to the tragedy. I had Eau Tendre on my skin three times before - and I marched straight to one of my favourite perfumeries to buy the smallest bottle. I wasn't 100 percent sure and 30 ml are not too much. In my perfumery I did not meet the unbelievably nice, knowledgeable and patient young lady, but two young men, brand Hipster. My wish for "Chance Eau Tendre" was commented with "Well, if you really want something of high quality, then you should go in the direction of natural fragrances. At Chanel you pay the name, but the perfumes are simply stirred together in huge stainless steel tanks...." Zack, slap in the face. Politely I had another (supposedly natural - and of course even more expensive) scent sprayed on my hand, but it didn't let me spontaneously break into hymns of praise: And I left with Chance Eau Tendre. In the next weeks I used it again and again, found it good, but not particularly exciting. Until the temperatures rose - and every time I left the house I was accompanied by a wonderfully fresh, harmonious, delicate but clearly perceptible little cloud. Apparently Chance Eau Tendre needs slightly higher temperatures on my skin in order to show off perfectly. It starts with a fresh citrus top note. For me it doesn't smell clearly like grapefruit (here my standard of comparison is always from Hermes: Eau de Pamplemousse Rose), but more delicate, less bitter. I imagine myself smelling quince, but again fresher and a little more bitter than I have stored quince juice as a smell. Flowers are spreading underneath: I can smell jasmine and iris, the hyacinths actually not (hyacinths in closed rooms belong to the worst of all for me, just like lilies of the valley or huge lilac bouquets). But the flower scent is very sweet (not sweet!) - maybe this is due to the hyacinth. Over the next few hours, the fragrance transforms into a creamy, fresh, flowery layer of fragrance that can be smelled up close and is wonderful. After some time I almost don't notice the scent anymore (except I sprayed it into my hair in the morning and fan the scent air to myself). But: It's the scent that colleagues and friends keep telling me about! Meanwhile the 30 ml are almost used up and Chance Eau Tendre is the very first fragrance on the "Absolutely buy again" list. One more word on the subject of "natural" and "steel tank" versus the romantic image of scent noses that lovingly taste extracts of precious fragrances in back rooms. I'm sorry that I (as a prevented chemist) can't really believe that. I am convinced that the creeds, Etros and Atkinsons of this world - which my hipsters have praised as being of unequally high quality and "natural" - are always a mixture. And I don't think it's bad at all. What I find bad, however, is when I am suggested something is wrong with me, my taste and my nose, because I find Chance Eau Tendre from the stainless steel tank wonderful, but "Love in White" from Creed smells for me unfortunately after the contents of wet diapers. Well, dear people, that had to be said! Chance Eau Tendre doesn't have an inch of that distinctive Chanel quality we all know, so it seems. This fragrance is almost a complete replicate of Live Platinum by Jennifer Lopez. You should have seen the Chanel representative's face when I openly pointed out this similarity. Going on smooth yet soapy, Chance eau Tendre has a somewhat synthetic edge. Don't get me wrong, I do like both this fragrance and Live Platinum to a certain extent, however with the latter, I tired of it easily and ended up giving the bottle to someone who appreciated it. The grapefruit and quince are the obvious top notes, which tend to sparkle with vitality and youth. The heart however becomes increasingly soapy and musky, which gives me the notion that this fragrance hasn't been as well constructed as other fragrances in the Chanel line. With this fragrance, I think that Chanel is trying to please the younger crowd, letting them know that Chanel isn't just for the sophisticated, older ladies. In my personal opinion, and this is coming from someone in their early 20's, I'd much rather wear Chanel No.5 over this soapy, synthetic floral mess. The scent may be interesting, yes, and the lasting strength impressive like most Chanel perfumes are, but I honestly wouldn't advise anyone to fork out the big bucks for this. I say enough of all the Chance flankers, give us something new and unique Chanel! Write the first Review for Chance Eau Tendre (Eau de Toilette)!